Is it possible for JotForm to send an email reminder based on what a customer chooses in a form? For instance, if they choose option 1, they will receive an email reminder in 12 monts, if option 2, an email reminder in 6 months, and so on? It would be amazing if this were possible with JotForm! We're happy to tell you that this is possible with JotForm using the Conditions function. Simply click the Conditions button found in the Setup & Embed tab of the toolbar to open the Conditions Wizard. 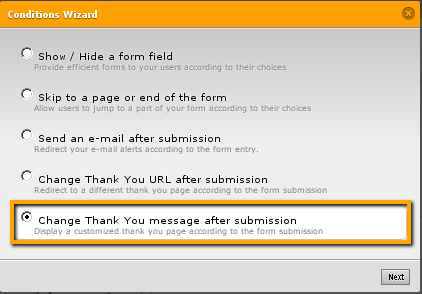 Then select Change Thank You message after submission option. Then, on the next screen, set up the conditions according to your needs. After reviewing your message, I think you mean you want to change the date when the email reminder will be sent depending on the options your guest chooses. In this case, this is not possible at this time. What I thought eariler was you wanted to have each option have its own unique thank you message. My apology for the confusion. i wish to send them another email automatically in 1 years time is this possible? As far as i know it's not yet possible within JotForm. But if i am mistaken, i am sure that one of my colleagues will also respond to this thread with a possible solution.